Collin (Daveed Diggs) must make it through his final three days of probation for a chance at a new beginning. 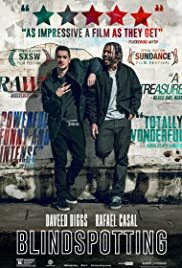 He and his troublemaking childhood best friend, Miles (Rafael Casal), work as movers and are forced to watch their old neighborhood become a trendy spot in the rapidly gentrifying Bay Area. When a life-altering event causes Collin to miss his mandatory curfew, the two men struggle to maintain their friendship as the changing social landscape exposes their differences. Explores the intersection of race and class set against the backdrop of Oakland. While in the theaters for another movie I saw a trailer for Blindspotting and thought, "This looks OK. Nothing special just OK." Then sometime later I saw a second trailer and thought, "Hmmm, this looks like something I may want to watch." I'm so glad I watched it. The movie is incredible. Now, a little disclaimer: I definitely gave it a star or two more for being Oakland based and Oakland themed. And it wasn't simply that Oakland, California was the backdrop, no! It was thoroughly Oakland from the soundtrack, to the BART train, to the big wheel bikes, the big rim scrapers, the neighborhoods, and of course the A's, the Warriors, and the Raiders. 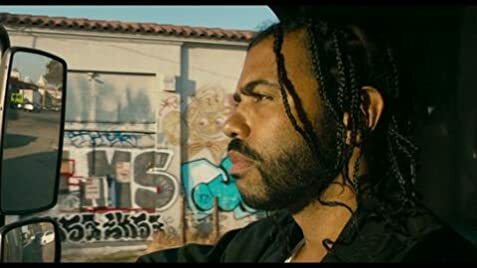 Blindspotting definitely appeals to the Bay Area niche but it also has a larger universal appeal for anyone living in an urban area. This movie was so well written, directed, and acted--they hit the trifecta. The center focus was the two main characters, Collin (Daveed Diggs), who is an African-American male on probation and Miles (Rafael Casal), who is a white male that is Collin's best friend and a bit of a loose canon. The dynamics between them was so fascinating and illustrated so well: a black man trying to be straight and having to be extra careful and a white man who is almost completely reckless yet not having the same fears. But the movie tackled more than that. It covered gentrification, police brutality, living as a black felon and living as a white male who's just a product of his environment. It deftly handled all of these sensitive and delicate topics without offending the sensibilities or coming off trite. There was some powerful imagery, some powerful situations and even more powerful dialogue. The script was clever, intelligent and so spot on. Blindspotting is Oakland's Do the Right Thing, or Boyz n the Hood, or even more appropriate--Good Will Hunting. This has been the best movie I've seen this year and that's saying a lot. I hope the writers, Daveed Diggs and Rafael Casal, get their due recognition as well as the director Carlos Lopez Estrada. This movie could not have been easy to pull off and I think they all did a magnificent job. 52 of 92 people found this review helpful. Was this review helpful to you?